My Little SUPERBOX is here! This is the March Box from My Little Box which if you do not know already it's a Monthly Subscription Box that is themed each month for just £11 + £3.95 per month! My Little Box aims to delight and surprise you every month. So what's Inside each MY LITTLE BOX? So What's The Them of This Months Box? Upon Opening that Brown Cardboard Box, All I could see what bright colours all around the box and a Superwoman illustrated on the box. 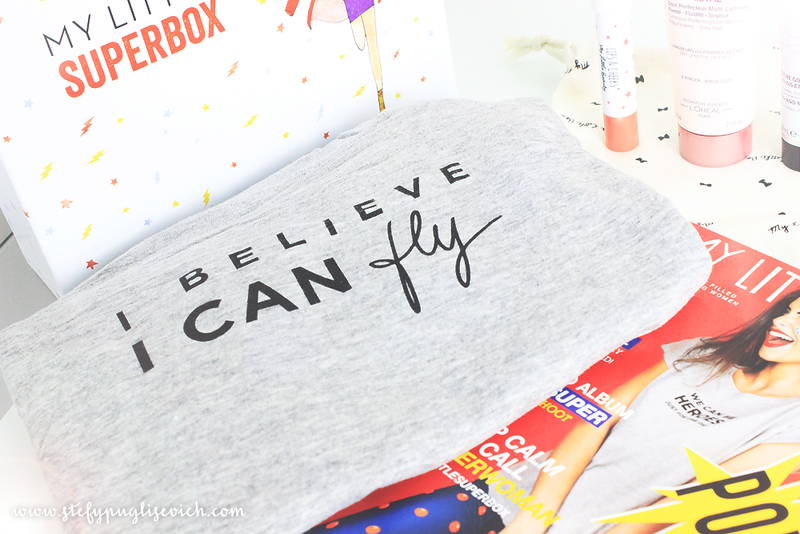 MY LITTLE SUPERBOX was the name stamped on the box and I can't wait to show you whats inside. Tied with a Branded My Little Box Ribbon are all the goodies for this months Box. It's always a fun experience opening up these boxes as you never know what you are going to get and that is the best part. It's exciting - Thrilling if most and just a little something extra on the side that I look forward to receiving. 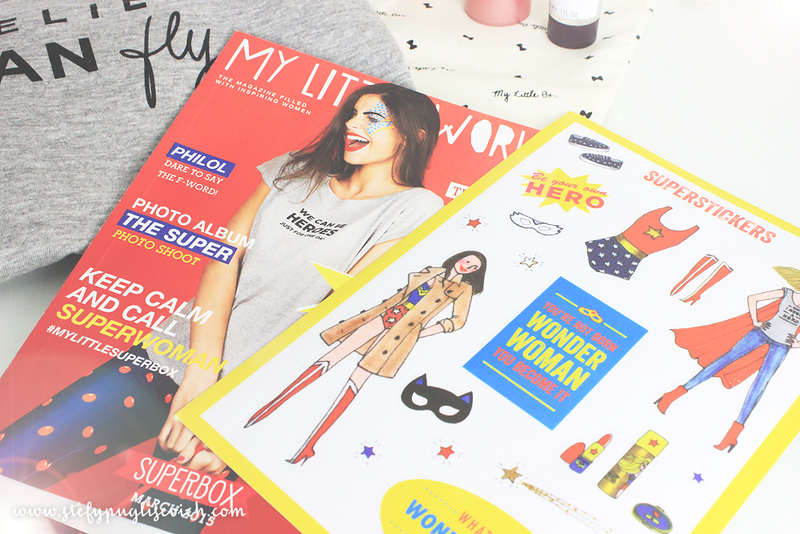 Apart from the Lovely Goodies, you always get a Magazine filled with inspiration, interviews and how to's and a little inspirational postcard and for this month we've got a Sticker set sheet full of wonderful inspirational quotes around superheroes and how to be your own hero. OH MY GOD! This Tee is just the cutest Tee ever. No one would ever expect to receive a T-Shirt in these boxes but with MY LITTLE BOX, they make sure you're surprised every single time. 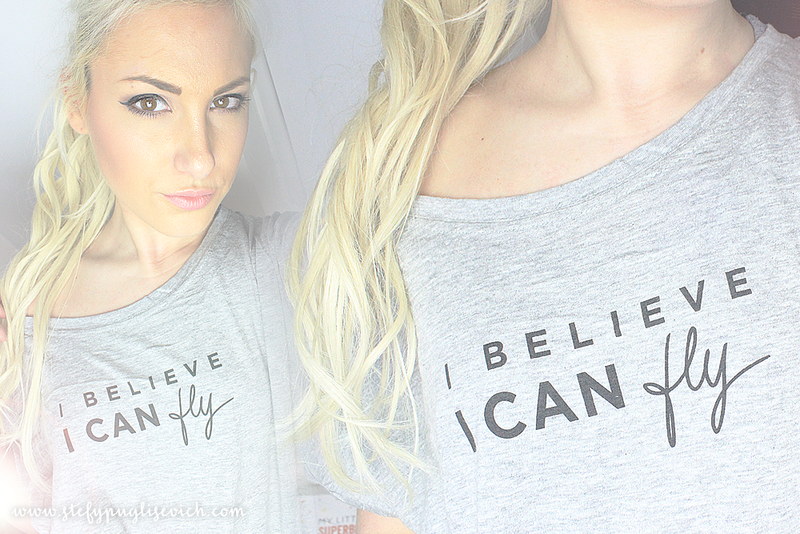 "I Believe I can Fly" is a gorgeous soft Grey 100% Cotton (one size) Scoop Neck T-shirt. It will probably be a comfy Oversized T-Shirt for me and I cannot wait to wear this. 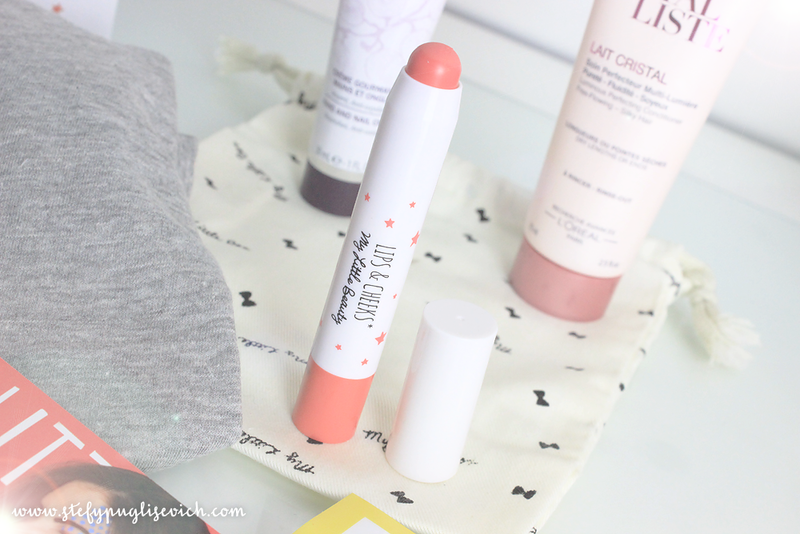 I always love it when they include a product from their own Line My Little Beauty. 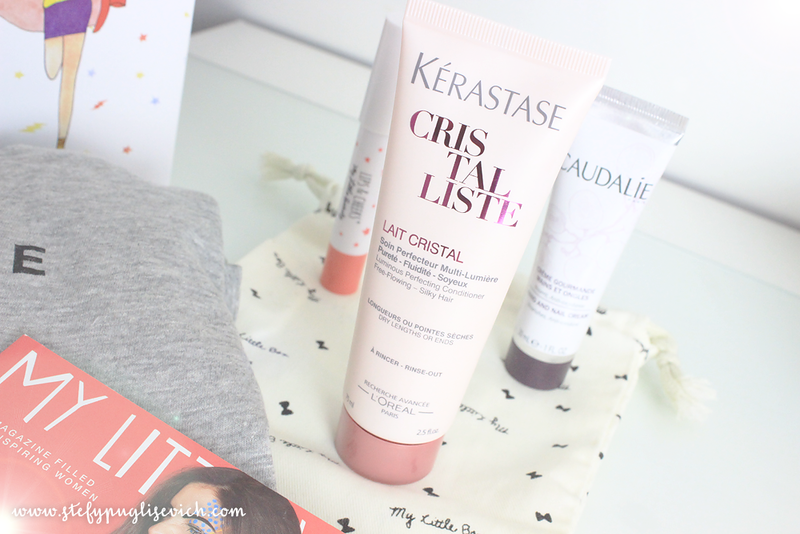 The previous items have been amazing especially their Micellar Water (Oct '14 Box). 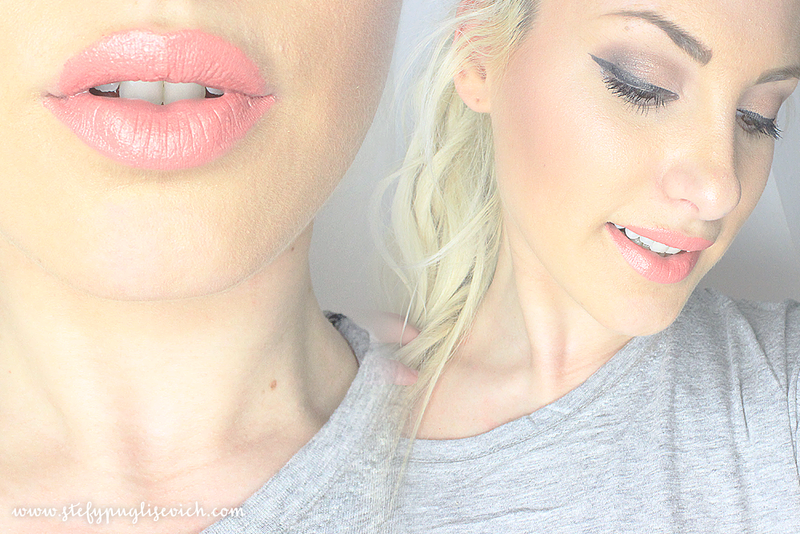 This Pencil is a gorgeous Peach Shade which is perfect with Spring and Summer around the corner. It's got more of a Cream-Shine Feeling to the skin so It will probably be a perfect Cream-Shine Lipstick and have a touch of a powdery finish if you wanted to use it as a blush. This product is said to be a Luminous Perfecting Conditioner - Free Flowing Silky Hair. It is supposed to leave hair looking smoother for a feather light finish. One should apply to wet hair, massage through hair focusing on the ends and leaving for 2 minutes before washing out. The scent is very fragranced on a more rose floral scent which will leave your hair smelling rather amazing in my opinion. 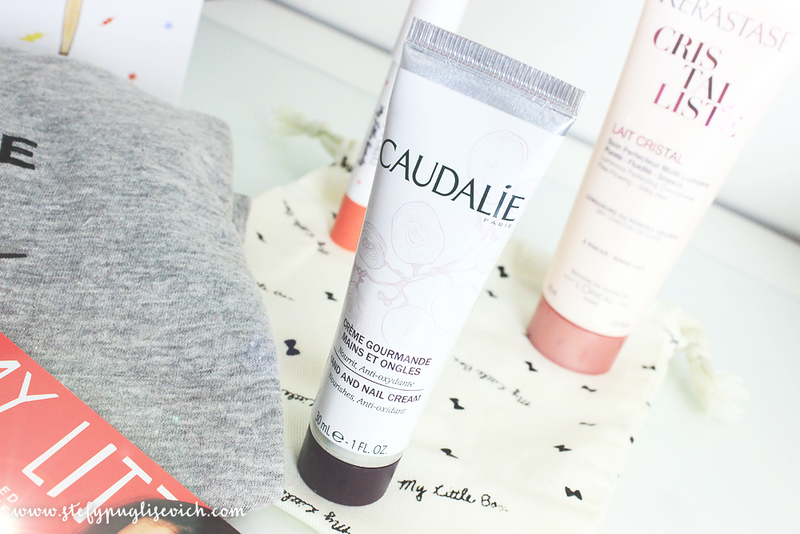 I do love hand creams, I'm a huge sucker for anything to moisturise the hands. I carry one in every bag and even at work I have to moisturise them at least twice a day. This Hand Cream has all the benefits - Grape seed Oil, Organic fair-trade shea butter, avocado and olive oil and other amazing ingredients that will smooth, soften and repair hands. With the little 30ml Handbag size, it's a perfect way to trail this out as the original size is a 75ml which is probably in my opinion a bit too big to carry on the go. The scent is citrusy a mixture of Oranges, Tangerines and a whole lot of Citrus going in one tube. One I would definitely recommend for anyone who loves citrus scents. Overall, These surprise boxes never disappoint, they are little boxes of surprises that will actually be used and not kept in a box underneath my table like some other beauty boxes I have bought. 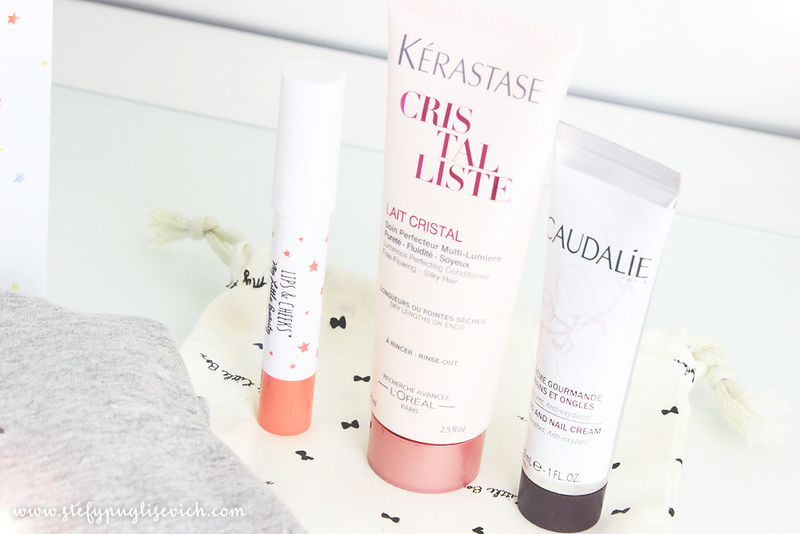 The items are products I will try and test out and eventually repurchase if I do like them.